It’s National Black Cat Day on October 27! Today we celebrate black cats because they need a little positive PR. People avoid black cats for a few reasons, some superstition to thinking they don’t photograph well. The result is that black spend the longest time in shelters —an average of 13% longer than other cats. Today we celebrate the beautiful black cat, including many of our favorite pop culture black cats, like Sylvester, Felix the Cat, Cat Woman, and The Cat in the Hat. Black cats are iconic, and National Black Cat Day is a way to celebrate that! This 13thcentury Latin church document is where Pope Gregory IX first suggested black cats were associated with Satan. Poe published his story "The Black Cat"in 1843, about a murderer carefully concealing a crime, but eventually breaking down and revealing himself because of a nagging reminder of his guilt. If you already own a black cat, today is the day to show it off on social media. Because we’re sure you never show that cat off any other day, right? Show it off, drawing particular attention to its fur color, and hashtag it with a reference to the fact that today is National Black Cat Day! Some of the most famous cats in popular culture are black cats! Watch a TV show or film that embraces the black cat to celebrate the day. Examples include "Hocus Pocus," "Sabrina the Teenage Witch," and Sylvester from Looney Toons! If you've been thinking about adopting a cat, today is a great day to head to your local animal shelter and bring one home. Of course you should choose the right cat for you, but honor of the day, spend a few extra minutes with a black cat, she may be just the cat for you. 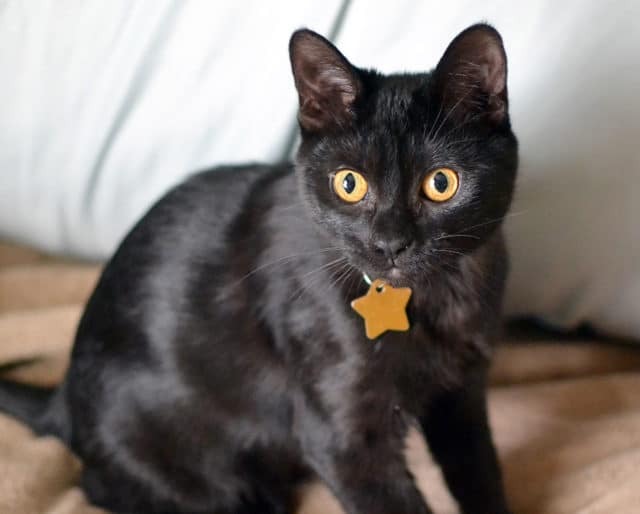 Because black cats are lucky—seriously! Not everywhere, but in England, in particular, if a black cat crosses your path, it’s considered good luck. If you’re Scottish, a strange black cat arriving at your home means you might win the jackpot. In Russia, all cats are viewed as lucky. Other cultures where black cats are viewed as unlucky are just wrong about this. For example, in Germany, if a black cat crosses your path from right to left, it’s considered bad luck, but the opposite is good luck. Pirates also happen to believe the black cats walking towards you are good luck, but that black cats walking away from you are bad luck. Which is nonsense. Trust us. We checked. If you happen to own a bunch of dark furniture, then a black cat’s fur won’t show up on it. This is definitely the best basis on which to purchase a black cat. It outweighs other considerations such as a cat being for life, not just for Christmas, and whether or not you happen to even like cats. Yup. Furniture preservation is of paramount importance in life. Some cultures believe black cats might actually be shape-shifting witches. In our opinion, that isn't scary,that's pretty cool. So get a black cat and name it for your favorite witch! It can be your little secret, just you and Sabrina.